This post is about how to take one of the Library of Congress tours of the Jefferson Building in Washington, D.C. It also highlights the exhibits and architecture that is on display there. Be sure to join us on one of our Capitol Hill & Library of Congress Tours. The Library of Congress is home to over 158 million items including books, manuscripts, maps, photographs, films, and more. Today, the complex has multiple buildings but the most breathtaking is the original: the Thomas Jefferson Building. The Library of Congress is free to visit and open Monday – Saturday 8:30 am – 4:30 pm and is closed on Sundays, Thanksgiving, Christmas, and New Years. If you’re looking to get the Library to yourself, you’ll want to visit early in the morning as soon as it opens. It’s busiest at lunchtime, especially on Tuesdays and Fridays. We often run our tours in the afternoon, so you’ll miss the lunchtime crowd if you join our Capitol Hill & Library of Congress Walking Tour. Address: 10 First Street, SE, Washington, DC 20540 (map). We recommend using the map link to get exact directions, as there are 4 Metro lines in two stations for access to the Jefferson Building. The closest is Capitol South (Orange/Silver/Blue), which is just a 5-minute walk. The other is Union Station (Red), which is a 15-minute walk. Learn more about riding the Metro with our guide. Find and reserve available parking in the area with Parking Panda. You can also access the Library of Congress and bypass security if you’re already in the Capitol Visitor Center. There is a tunnel that connects the two buildings, allowing you to go to the Library of Congress without having to go back through security. The tunnel will bring you to the basement level of the Library, where you’ll also find the Visitor Desk and the start of their guided docent-led tours. As with most building in D.C., expect to go through security. You can find their exact guidelines here. There is no eating or drinking allowed in the building, though visitors are allowed to enter as long as any food or drink is stored in a bag. Photography is allowed in most of the building, though there is no flash photography allowed of the bibles, the Reading Room, and the Jefferson Room. If you’re visiting the U.S. Capitol Building first, you do not need to go through security again at the Library of Congress, if you take the access tunnel that connects both. Do note that food and drink are not permitted in the Capitol. You’re also walking distance from Union Station, where you’ll find a nearby Metro Station and food court for quick meal options. It’s a beautiful building in its own right, so take our self-guided tour of the building why you’re at it. About a 10 minutes walk along Pennsylvania Ave, you’ll find Eastern Market. It is one of our favorite neighborhoods to explore local restaurants, or join our Eastern Market Food Tour! The Library of Congress offers tours of the Thomas Jefferson Building, including guided, self-guided and virtual tours, but why not let one of our guides show you this magnificent building on one of our Library of Congress Tours, which also includes reserved tickets to the tour of the U.S. Capitol Building. These are the main tours that visitors enjoy on most days. This free general tour covers the art and architecture of the Jefferson Building, including a view into the main reading room, as well as the history and purpose of the library itself. They last 1 hour and take place every day, but Sundays. Tours depart from the ground floor information desk. The tour schedule is as follows. NOTE – There is no tour at 12:30 pm on Saturdays. Below, we have provided our extensive self-guided tour of the interior and exterior of the Jefferson Building. The library itself offers a downloadable pdf self-guided tour with limited information in 11 foreign languages. They also offer an online tour, though we recommend using our self-guided tour. On-site, visitors can find interactive touch-screen displays that explain what is in view of the visitor. Once you pass security, the first major room is the Great Hall. As you enter the Great Hall, you’ll immediately look up. This interior section of the building is nearly double the height of the entrance hall. The works you see all around you are the effort of 50 artists to contribute to the sculptures, paintings, and murals. Above you, look at the rose windows in the ceiling. Most people assume that it is silver leaf surrounding the stain glass windows, but it is aluminum leaf, which more valuable at the time than silver leaf. The various single names you see inscribed on the ceiling throughout the building are the last names of authors who have made great contributions to literature. The first one most people spot is Bacon! Below you are the symbols of the zodiac signs surrounding a brass inlay of the sun in the center. Look at the staircases on either side of the Great Hall. Along the outside of each banister, you’ll see “putti” which were popular during the Italian Renaissance. These figures each represent a different profession or hobby that was popular in American life at the time of the construction. If you look closely at these little boys, each is holding an attribute of their profession. A mechanic holds a wrench, an artist holds a paintbrush, an etymologist holds a butterfly net. See if you can figure out what jobs are portrayed by looking at each of the items held by the putti. The original idea was to put sculptures of adult men holding these symbols of professions but the proportions did not work out as well within the banister as the putti. In the center of each banister at each side, the theme of the entire library is once again represented: the universality of knowledge. On either side of the globe, figures represent the Americas and Africa on one side with a view of these continents on the globe they hold, and a view of Europe and Asia on the opposite side of the Great Hall. View rare, perfect copies of the Giant Bible of Mainz (the last handwritten bible before the printing press) and the Gutenberg Bible (the first Bible printed using the printing press). Here you can view two bibles from the 1400s Germany. Look closely at the Bible of Mainz and you can often see the lines across the page put there by scribes to make sure they stayed in a straight line. See how the typeface of the printed Gutenberg Bible is similar to the handwritten Bible of Mainz? They didn’t have Times New Roman back then! Once you’ve seen those, head upstairs to the upper level of the Great Hall. Note the groves worn into the marble steps from more than a century of fellow travelers and researchers. On the east side of the building, you’ll see a set of steps leading up to the Main Reading Room Overlook. To view the Main Reading Room, you can access the overlook from the second level of the Jefferson building. A set of stairs in the back leads to a small walk-through so you can have a peek into this beautiful room. The library discourages flash photography and talking in the walk-through as there are often researchers below. You may see a sign that says “Official Tour in Progress” – just come back in a few minutes when the tour is over for your chance to walk through. During busy times, a staff member is on hand to monitor the line but otherwise, just head up the steps and stay to the right! As you head up the stairs toward the viewing platform, you will be greeted by a large mosaic of Minerva, the Roman Goddess of Wisdom, holding a list of fields of study and accompanied by an animal we all associate with wisdom: the owl. Inside the Main Reading Room, look up towards the dome. The personification of Human Understanding is surrounded by twelve figures that represent the various cultures that have contributed to the universality of knowledge. The Middle Ages represent Modern Languages. Italy represents the Fine Arts. Germany represents the Art of Printing. Want to see the Main Reading Room up close? A few times a year on certain holidays the Main Reading Room is open to visitors! The Thomas Jefferson Building, an Italian Renaissance-inspired structure, opened in 1897 to great renown. When people visited Washington, they didn’t write home about the Capitol Building or the White House, instead, they wrote home about the Library of Congress. In many ways, the grandiosity of the building was an attempt (and a successful one) to prove America’s strength in science, literature, and the arts – subjects that European countries had been dominating for hundreds of years. For example, the building’s dome, which is topped with the “Torch of Learning,” is plated in 23-carat gold. The art featured on the building are meant to showcase human achievement. However, it also reveals the prejudice of the time, as most of the great thinkers featured throughout the building are male and Westerners. However, representing the universality of knowledge, there are also thirty-three ethnological heads, which show a wide variety of countries and cultures, that surround the exterior of the building. As you move to walk up the steps, take a moment to view the fountain on road level. This fountain of Neptune, Roman God of the Sea. 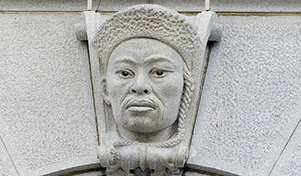 His sister, Minerva, is featured inside the building. The king is surrounded by his court with his sons, the Tritons, and horses, symbolizing water. He protects the sea of knowledge that is the Library of Congress’ collections behind him. The grand figure of Neptune would be 12 feet tall if he were standing! While the fountain is not always on, the wavy lines of the sculptures do mimic the flowing of the water. A particular favorite is the “spitting” turtles at the front of the fountain. On the upper level of the Great Hall, you’ll find the Thomas Jefferson Collection in the south gallery. The actual collection is in the back room so you will have to walk through one of the Library’s rotating exhibits to get to it. A must-see while visiting the Library of Congress is the collection of Thomas Jefferson. After the Burning of Washington in 1814, the original library collection was destroyed. Jefferson sold his 6,487 books to create a new collection but his was different – it included a Latin translation of Euclid Geometry and a book on beekeeping. He said that there was no topic that one day Congress might not need address. His collection is circular and you can imagine Jefferson at his desk in his swivel chair surrounded by his books. They are organized into three categories: Memory, Reason, and Imagination, as directed by Jefferson. He, however, arranged his books on each shelf by size. When you’re viewing the books, they are not all original the Thomas Jefferson. Nearly two-thirds were lost in a fire but the Library was able to recreate the collection. Look closely at each book and you’ll see a tag sticking out of the pages on the top. No Book: They are still looking for one! Have any 18th c. books at home? Townball, roundball… baseball has been part of American culture since the mid 1800s and while its shaped the country and we started to agree on the rules, its been generally the same since then. Origins and Early Days showcases the beginnings with the “Magna Carta” of baseball, first baseball cards and more. Who’s Playing? displays items related to the love of baseball regardless of gender, race, and wealth. At the Ballpark explores the traditions of baseball games and baseball in pop culture. The Promise of Baseball talks about how baseball helps integrate and give immigrants and poor families a chance to prosper. The Art and Science of Baseball digs deeper in to the “moneyball” idea of baseball through stats. Exploring the Early Americas – Northwest Gallery – Second Floor. A collection of rare maps and other artifacts that document the history of the early Americas. Here you can view some of the 3,000 historic maps, including the first map to say America. Hope for America: Performers, Politics and Pop Culture – Bob Hope Gallery – Ground Floor. This collection focuses on the intermingling of Politics and Entertainment. Many artifacts are related to Bob Hope and others who found themselves in both worlds. This exhibit explores America’s involvement in WWI and the nation’s reactions to it at home and abroad. Learn about how the country faced the war with newspaper accounts, multimedia, and images from the front lines. Mapping A New Nation – North Gallery – First Floor. Abel Buell’s New and Correct Map of the United States of North America is the first map of the newly independent United States compiled, printed, and published in America by an American. Learn more. Visitors can obtain a library card at the reader registration station in Room LM-140 of the Madison Building. This building is across Independence Ave from the Jefferson Building. You will also have to go through security to enter this building. Room LM 140 is on the ground level to the left from security. Must be 16 years old or older, have a valid driver’s license or passport, and complete a brief registration process to qualify. Founded in 1800, the Library of Congress is the oldest federal cultural institution in the country. When the capital officially moved from Philadelphia to Washington, D.C., President John Adams signed an act that stipulated that a library be made available to Congress and that a “suitable apartment” be created to contain it. Thus, $5,000 was appropriated by Congress to establish the Library of Congress, which was originally housed in the Capitol Building. However, in 1814, British troops arrived in Washington, D.C. with the intention of destroying the capital city. The Capitol Building was burned, and all of the books in the Library of Congress were lost with it. Shortly thereafter, retired President Thomas Jefferson offered to sell his entire collection — over 6,000 books — to the U.S. government to establish a new Library of Congress. His collection caused some controversy; Jefferson’s library included books in foreign languages, as well as books on philosophy, science, and mathematics. Yet, Jefferson emphasized that “there is no subject to which a Member of Congress may not have occasion to refer.” The government eventually purchased his entire collection for $23,950. In 1870, the size of the Library would increase dramatically as the Copyright Law was passed, requiring that all copyright applicants send 2 copies of their work to the Library of Congress. The now rapidly growing collection required more space, and so Congress commissioned for a new building, specifically dedicated for use by the Library, to be built.